In keeping with past trends, full migration to this latest Microsoft Server Operating System will begin in earnest 12 months after its release, in mid-to-late 2004. This book will hit the market just as large enterprises begin the process of moving from Windows 2000 Server to Windows Server 2003. The title says everything you need to know about this book. No other book on the market combines this breadth and depth of coverage with the kind of product expertise and quality standard expected from Syngress. Every aspect of Planning, Installing, Configuring and Troubleshooting a Windows Server 2003 network is distilled and documented, with plenty of examples and illustrations. An unlike its competition, this is a book that was written from the ground up for Windows Server 2003. Everything a System Administrator will ever need to know about running a Windows Server 2003 network. 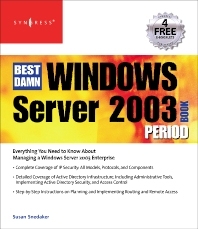 This is the book that meets the needs of today's Windows Server 2003 professional. Every aspect of Planning, Installing, Configuring and Troubleshooting a Windows Server 2003 network is distilled and documented, with plenty of examples and illustrations. What’s New in IIS 6.0?